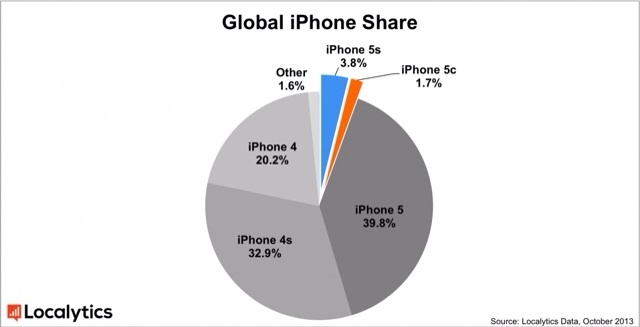 A new report from Localytics reveals that the iPhone 5s and 5c now represent 3.8% and 1.7% of all active iPhones globally. Notablty, Japan has the highest concentration of active iPhone 5s and 5c relative to other iPhone models, representing nearly 10% of all active iPhones in that country followed by the U.S. with 6.4% (vs. a global average of 5.5%). Interestingly, the Germans are the biggest fans of the high-end iPhone model, with the 5s holding almost a 9 to 1 edge over the 5c. Of the top 8 countries with the most new iPhones, the U.S. is actually the most iPhone 5c-friendly. Take a look at the charts for more details.